The Caribbean Monk Seal is an extinct species, which belongs to the family of the seals. It was only native to the Caribbean Sea and Gulf of Mexico. In the West Indian region, it is known as the Caribbean Monk Seal Monachus Tropicalis. One can find a collection of their bones at the Tropical Crane Point Hammock Museum in the Key Vaca. When did the Caribbean Monk Seal go extinct? The Caribbean monk Seal families were pinippeds, those marine animals that could exist in an also out of water. They are primarily carnivorous. They belonged to the tribe of Monachus tropicalis. 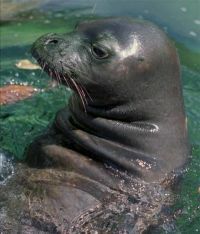 The Caribbean Monk Seal was a water based animal. It had some distinct characteristics. Some of the Caribbean Monk seal characteristics are here. It has a robust, fairly large and long body. It has a distinctive head and face. Its head is rounded, and has extended broad muscles. Their eyes are relatively wide spaced on its face, the nostrils open upwards and whiskers pads are fairly long and light in color. It has relatively short fore flippers, and its hand flippers are slender. They are of brown or grayish color. Algae grow on their pelage, due to which they appear slightly greenish in color. Their soles and palms were naked, and the underside of their body was pale yellow. They had well developed nails on anterior digits. Newborn seals had long and dark furs. The Caribbean Monk seal is a very tall animal, measuring about 1.8 to 2.7 meters. The male Caribbean seals even reach up to the height of approximately 3.25 meters. The adult female monk seal measures about 2.4 meters, and are slightly shorter than the male seals. The Caribbean seals are huge and heavy animals. They weigh around 250 to 300 kilograms on an average. Since the Caribbean monk seals are now extinct, they do not have any habitat now. But earlier they used to inhabit the Caribbean Sea which lies to the north west of Gulf of Mexico. They were also found in the region that stretches from the Bahamas to the Yucatan peninsula, and along the Central American coast. They used to live in the warm, temperate, subtropical and the tropical waters of the Caribbean Sea. These animals spend much of their time in marine environment, due to which they are primarily water based. They occupy rocky and sandy coastlines for their sheltered breeding purposes. They feed on lobsters, reef fishes and octopuses. They are very sluggish on land. It does not have any fear towards man and are very curious by nature, and this is the primary reason behind their demise. The Caribbean Monk Seal is formally declared extinct in the Red list of Threatened Animals by the IUCN. The last time that this animal was sighted was in 1952, from the Seranilla Bank between Jamaica and Honduras. Here a small colony of this animal was known to be found. Apart from this, unconfirmed sightings of this animal were noticed by local fishermen in regions of Haiti and Jamaica. The surveys continued till 1993. However, these sightings could not be confirmed as there was no conclusive evidence in support of its contention. The Caribbean Monk Seal feeds on eels, octopus, lobsters and the other reef fish. Those seals which were kept in captivity were fed fish which was cut into small pieces, and even small crabs. We do not know much about the reproduction behavior of the Caribbean monk seal. Nothing can be said certainly about the Caribbean monk seal breeding habits, as they are extinct now. Most probably, live pups were in early December, and this information is derived from the fact that the female seals that were killed in the Yucatan during December had well developed fetuses. This animal had an average life span of about twenty years. The females would give birth on sandy coasts or remote islands, and even the undisturbed beaches that were present in the mainland. The Caribbean monk seal was hunted widely for its blubber, so as to extract oil out of it. This oil was widely used for cooking purposes. The processed oil for even used for lubrication purposes. Caribbean Monk seals have a very few predators. The biggest threat to them is human beings itself. Even sharks are a very big threat to them. The Caribbean monk seals are agile swimmers, but still they do not move that quickly on land. They are not well equipped with an innate fear for predation on land. This is why the fishermen and pioneers take Caribbean monk seals as a relatively easy target. 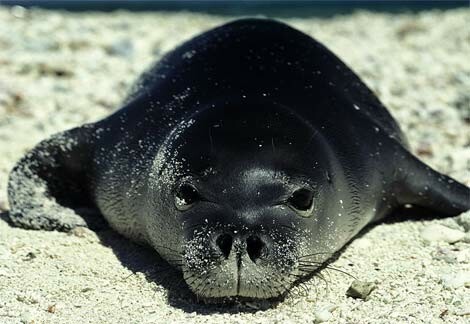 The Caribbean Monk Seal has only one identified parasite, and that is the nasal mite. It is recovered in great numbers in almost all stages of life from the respiratory passage of the animal. This parasite has also gone extinct with the extinction of this species. Over-fishing, global warming and marine pollution. Imbalance in their sexes, which leads to a situation of male mobbing. Highly sensitive to disturbance of any kind. Over-hunting by humans for oil, skin and hides. They were listed as endangered on March 11, 1967. The exact date of their extinction is not known. On June 6, 2008, after all the futile efforts to confirm their sightings, they were finally declared extinct. They were last sighted in 1952. They were extinct by nearly 1970s. 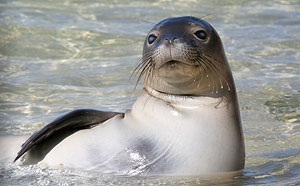 Their diet is similar to that of other monk seals such as Hawaiian monk Seal. 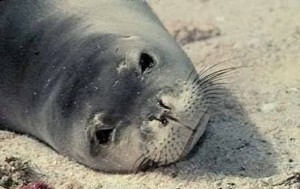 Monk seals should not be approached while in land or in water. You should never disturb a pregnant monk seal. Never come between a mother and a pup. Since the Caribbean Monk Seal is now extinct, you cannot see this species anymore. Check out its pictures and get an idea as to how this animal looked. The Caribbean Monk Seal is now completely extinct. We do not have any means by which we can retrieve this species back to existence.